So you've been invited to a meal at an Indian home. You may be thinking, "Oh my! I don't know a thing about Indian food traditions! What do they eat? How do they eat? How do they sit? Will I be expected to eat with my fingers?" You came to the right place. Before we start, however, chuck everything you thought about Indian food and traditions (in relation to food), out the window. Let's start with a clean slate and no presuppositions. That way, by the time we are done, you'll be dining like an Indian! Let's get to it. Most Indians are very hospitable and love to entertain. It is a sign of honor and respect to ask somebody over for a meal. In fact, even if you just casually visited the home of Indian friends, it is very likely you will be invited to stay for a meal. According to one traditional saying, "Atithee Devo Bhava," which means, "The Guest is God!" So, unless you have a very good excuse for why you can't make it, do accept, as refusing for frivolous reasons might give offense. Keep in mind that it's perfectly okay to arrive at your host's home 15 to 20 minutes after the time you have been invited at. You might actually surprise your host (unpleasantly sometimes) if you arrive at exactly the time of the invitation. When you get there, it is customary not to be served the meal soon after you arrive. Instead, you might have a few drinks -- whether or not they are alcoholic beverages depends entirely on your host -- a snack or two and some chit-chat. In most modern Indian homes, while alcohol is no longer taboo, women will often not drink it. Once the meal is announced, everyone will wash and dry their hands and proceed to the table. Unless you are in a very rural place, most families eat their meals at a table and not sitting on the floor! You could very well be served a buffet-style meal depending on how many people are present at dinner and whether all can be accommodated together at the host's table. For now, let's presume you are dining at a table. Instead of individual portions, there will most likely be several dishes of food from which you can help yourself. 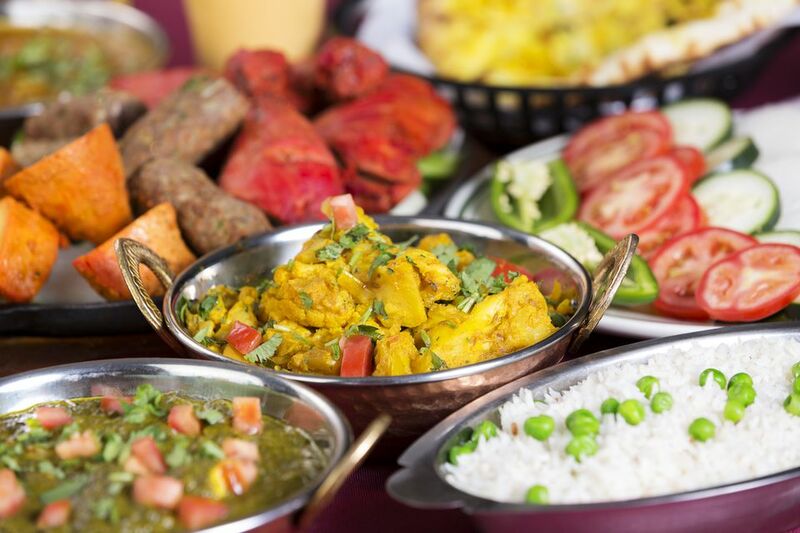 Most Indian meals (depending on whether your host is vegetarian or not) comprise of rice, Chapati (flatbread), meat, vegetable and lentil dishes, salad, yogurt, and pickles. Water is served with every meal, but in current times, you could be offered a glass of wine. Once you've served yourself, wait for everybody else to do so before you start eating. It is not customary to make a toast or pray, but that depends on your host. While it is perfectly acceptable to use cutlery to eat your meal, lots of Indians prefer to eat with their fingers. In fact, there is a joke about how food tastes better when eaten with the fingers! This is done neatly and only the tips of the fingers are used. It is not considered polite, contrary to popular belief, to actually put your fingers in your mouth or lick them. Do not, under any circumstance, use your left hand to eat! This is considered very rude and unhygienic. The reason? Indians consider the left hand to be 'unclean'. Another no-no is offering anybody food from your plate or helping yourself to some from theirs. But then again, you weren't going to do that anyway. As you are eating, don't be surprised if your host or hostess urges you to have some more and "not be shy." Most times, even when you gently say you've had enough, you will be coaxed and cajoled to have "just a little more." Try not to refuse, as that is considered rude. In Indian culture, how much you eat is considered an indication of your enjoyment of the meal. In the face of such politeness, you'd think burping would be extremely rude. Not so! Well to be precise, in some states in India, not burping is actually frowned upon. In these places, burping is a sign that you have greatly enjoyed your meal. Regarding burping: Please refrain unless you know your host intimately and are acquainted with the state of their origin and whether or not it is polite in their tradition. Most meals end with dessert and some sort of digestive nibbles. Tea and or coffee may be served later too. As with any other culture, feel free to extol the virtues of whoever has cooked the meal. It will ensure you are invited again and again. If you're feeling a bit overwhelmed with all the do's, don'ts and points at which offense could be taken, please don't. Even though Indians may appear to have an umpteen number of traditions, they are extremely gracious hosts and very accommodating. Faux pas are promptly ignored (even if everybody noticed them) and quickly forgotten. Remember to relax and enjoy! Believe me, you will have many reasons to do so.